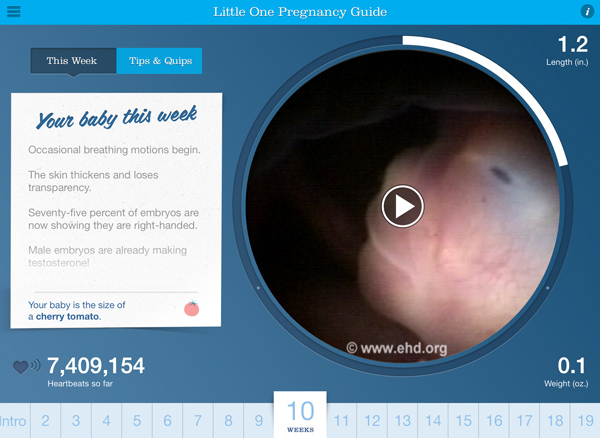 Use your tablet to show a pregnant woman what’s going on with her baby in seconds. How often do you talk with a pregnant woman who is almost totally unaware of the astonishing ways her baby develops—especially during the first trimester? How often does she think her baby is just a blob of cells? The Little One™ Pregnancy Guide App for iPad will enable you to show each pregnant woman (and her companions) what her baby is doing in just seconds. Say goodbye to outdated videotapes and clumsy DVD players. Stop being sabotaged by poor Internet connections and slow streaming video. Instead, show memorable images of developing babies on demand and without delay! Instantly show her what her baby looks like and explain the new abilities her baby gains during pregnancy, week by week. Or hand her your tablet and she can see for herself! Be confident having rare imagery and development milestones derived from 100 years of human development research at your disposal. Use the Guide in your office, clinic, classroom, or wherever you normally teach about pregnancy or interact with pregnant women. The Guide is more effective than ultrasound during the first weeks of development when ultrasound is not that informative. And a great supplement thereafter. Become a pregnancy educator for your community. The app is already licensed for use in public settings, educational settings, medical settings, and at home. Train your staff, patients, students, visitors, family, and friends. Use the app at conferences, lectures, grand rounds, and everywhere else without any Internet connection. “Until I saw the video [4-D Ultrasound] of Katy at 20 weeks old, I could not relate to this lump growing inside me enough to want to give up my cigarettes. But as soon as I saw the beautiful pictures of my daughter, it felt criminal to do anything which might cause her harm. If you are not incorporating prenatal imagery into your pregnancy education efforts, you are not being as effective as you can be. With this new app it has never been easier! The Guide is simple to use and the images and facts are easy to understand. Help make her first—and subsequent—prenatal appointments unforgettable and inspirational! 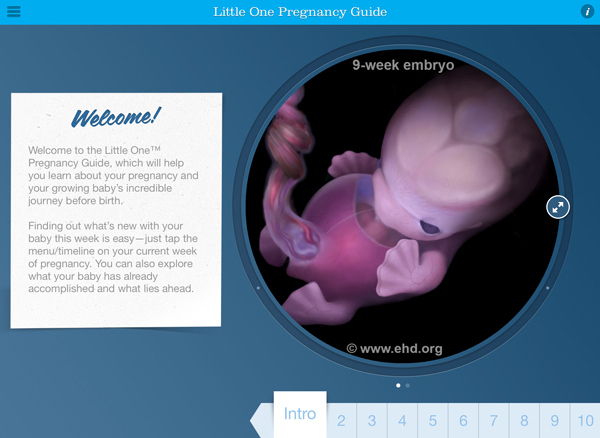 Download the Little One™ Pregnancy Guide App (a free download) from Apple's App Store to your iPad, or from Google's Play Store to your Android tablet. We also have a phone app. 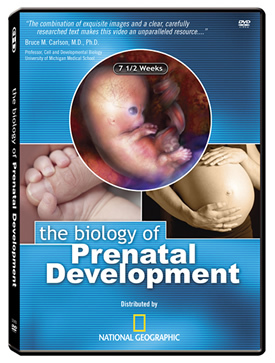 The video clips presented in the app are adapted from The Biology of Prenatal Development, a 42-minute science documentary, which presents normal human development from fertilization to birth. The program, written and researched by a medical doctor, has been endorsed by medical and embryology experts as well as numerous high school educators and has earned eleven video awards from five film competitions. It has been distributed via DVD by EHD and National Geographic since 2006. Clips from this DVD have been viewed online tens of millions of times around the world on ehd.org, YouTube, Facebook, and many other websites. Apple, the Apple logo, iPhone, and iPod touch are trademarks of Apple Inc., registered in the U.S. and other countries. App Store is a service mark of Apple Inc. Android and Google Play are trademarks of Google Inc.